Enemy at the Gates has arrived and I thought I’d have a go at making a force from models I’ve already painted from my previous spin on the mid-war Eastern Front roundabout. Over the years I’d built up a reasonable collection of Soviet models I’ve used in various forces for mid-war. So having a look through them I thought I’d make a Mixed Tank Battalion (see page 19 of Enemy at the Gates). The Mixed Tank Battalion does not have a Formation Commander, so it’s straight on to selecting my Formation’s Units. This unusual formation consists of three tank companies, each of a different type of tank. The first compulsory option (black) contains either a KV-1 Tank Company or a KV-1S Tank Company. I’ve gone with the KV-1 Tank Company because I prefer the higher armour of the older KV-1 model and feel I don’t require the extra speed offered by the KV-1S tank. Another reason to take the KV-1 is that I have a box of about 10 of them painted (don’t ask me why, I don’t want to talk about it). I can take 3-5 KV-1 heavy tanks. I’ve gone with 5x KV-1 for 40 points. The second compulsory (black) choice is either a T-34 (early) Tank Company or a Valentine Tank Company. I’m not a fan of lend-lease stuff, I feel if you are going to do a Soviet force, take Soviet equipment. I’ll be going with the T-34s. The option is for 3-10 T-34 (76mm) tanks. I’ll go with 6x T-34 (76mm) for 31 points. The Formation has three other unit boxes, all shaded grey as optional. 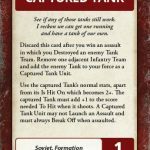 One more tank option, an infantry option, and a mortar option. For the last tank option you can take either a Valentine Tank Company, a M3 Stuart Tank Company, or a T-60 Tank Company. I’m taking the T-60s because they are Soviet and I have all but one painted. I’ll take 7x T-60 for 6 points. I will take one more formation unit. I’ve decided to go for the infantry option with a SMG Company. I’ll get the smaller option with 15x PPSh SMG Teams and 1x Komissar Team for 15 points. My last Unit will be from support. I’ll take a 122mm Artillery Battery with 4x 122mm howitzers for 8 points. With the only modelling require to field this force being to paint one T-60 to go with the six I already have I will get this on the table top quite quickly. I think the T-34s and KV-1s will prove pretty resilient against most forces. However, my key problem may be my lack of air defence and an observer. The Mixed Tank Battalion does not have a formation commander, so no one to spot for the artillery other than the artillery themselves. This is the reason I went with the 122mm howitzers rather than the Katyusha rocket launchers, as the howitzers are a bit less vulnerable to enemy direct fire. 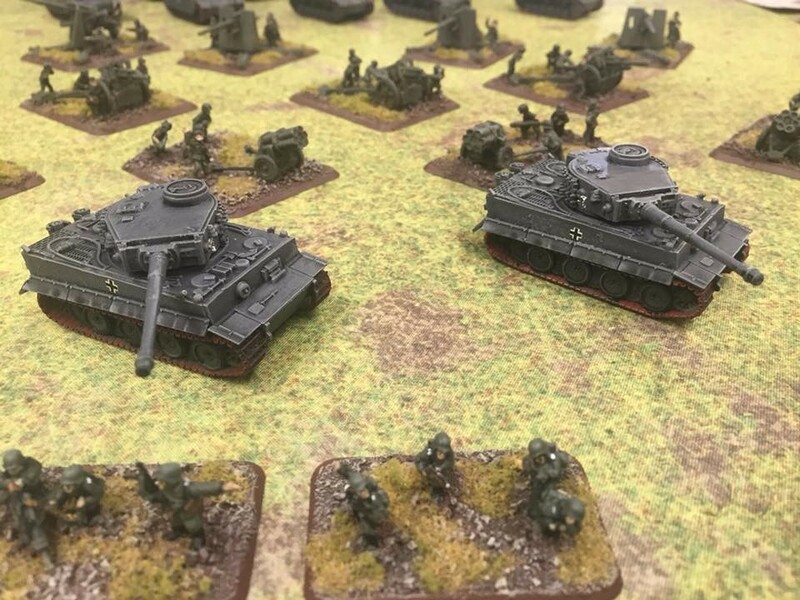 To observe their fire the howitzers will have to have direct line-of-sight to their targets, I just hope I can occupy the enemy enough with my infantry and tanks to allow the artillery to bombard uninterrupted. As for enemy aircraft, I’ll just have to hope they don’t turn up too often. 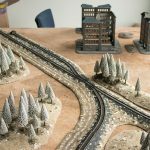 I’ve made a lot of terrain for Battlefront in my time here, but over the past 3-4 years I’ve been building a terrain table for myself as a slow burn project. 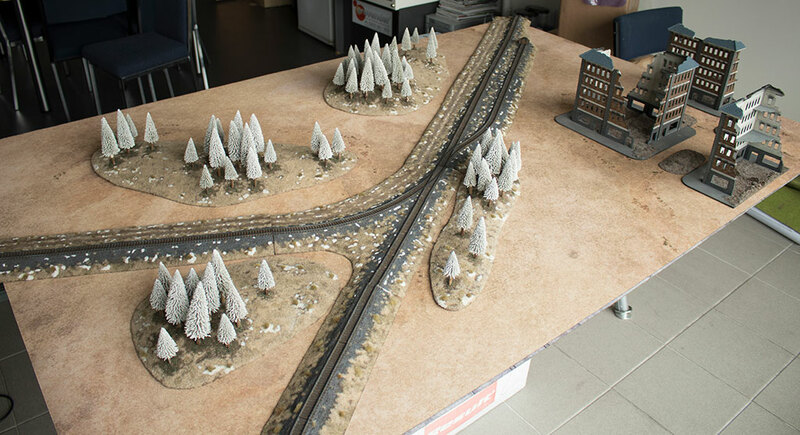 Since a lot of my armies are Eastern Front themed I decided to make it represent the steppes of the Eastern Front. I liked the idea of doing a winter table but didn’t want to make a completely white table, as it would make the table too specific, so decided to make it in a transition period, either autumn or early spring, so quite arid but with a scattering of snow. 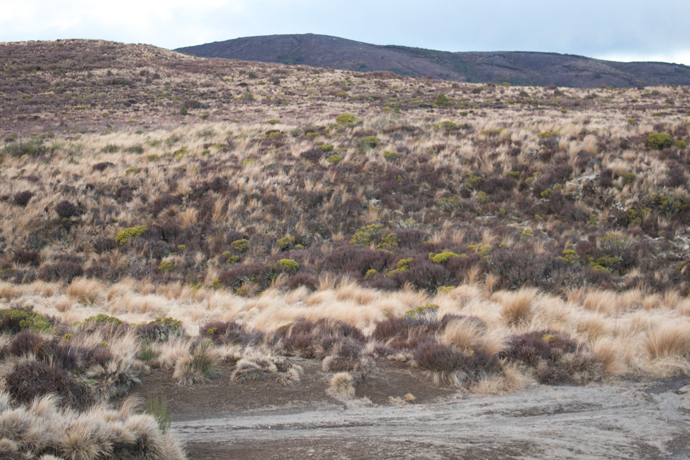 As it so happens every year on the way to Panzerschreck we travel via the Central Plateau which is as close to the Russian steppes as we get in NZ, so I’ve been using that as an example. 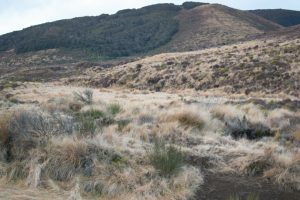 In the sample photos here there is no snow, however in previous years there has been a light scattering of snow that has collected in small drifts around the bases of the tall grasses. 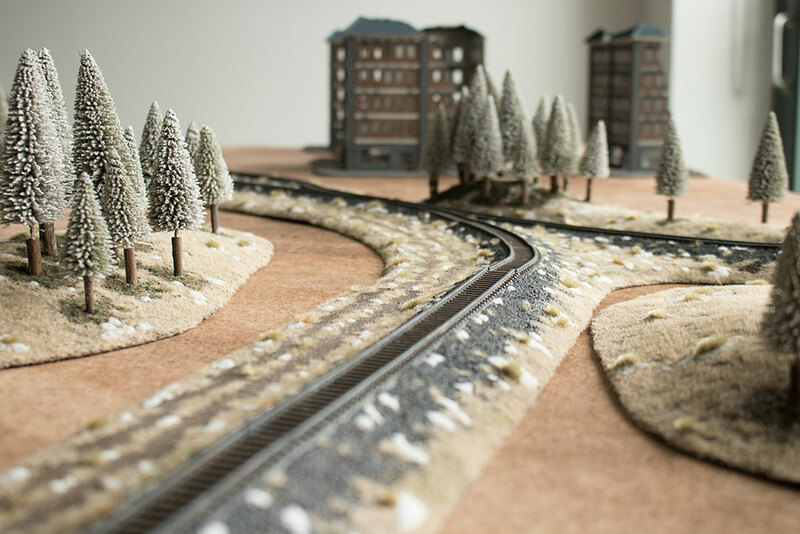 Originally, I was going to populate the hills and railways with more tufts and snow, but decided not too as a compromise to make it slightly easier to photograph and play on. 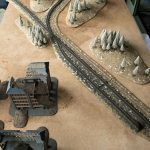 I wanted the hills to represent undulating terrain, rather than slab sided hills, so when I was designing them I started with quite large pieces of MDF, glued some polystyrene to it and then shaped it so that the highest point wasn’t much taller that a large tank. Since they are representing undulating terrain I also decided to build forests/woods onto the hills to make them more dynamic, and because I don’t think area terrain should only be one thing. 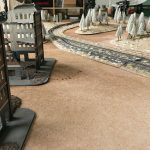 I want to add 50% more terrain, but most of that will just be enhancing pre-painted Battlefield in a Box Terrain, so it won’t take that long to finish it off. When the city mat comes out I’m going to get one and cut a section out of it to put under my buildings. 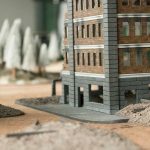 I’m also going to paint up a third building to finish off the city corner. 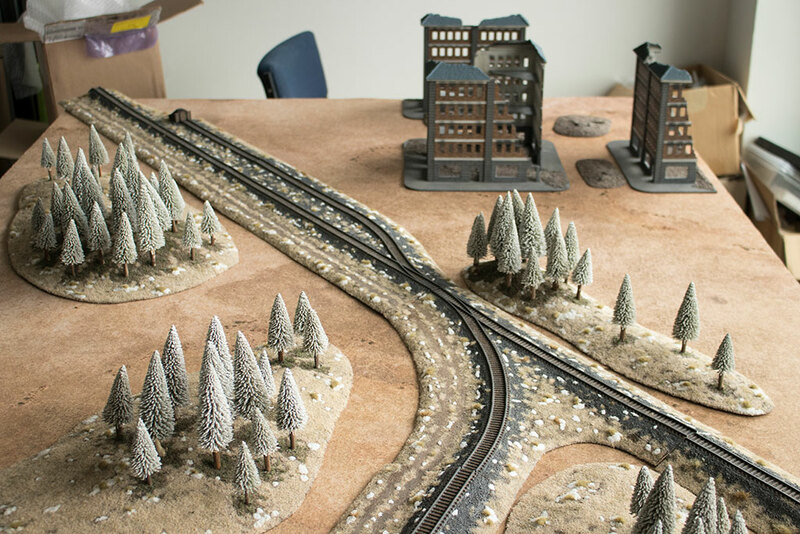 The other thing I’m going to do is flock up a whole lot of fields and fences to add in a bit more concealing terrain. Eventually I want to be able to make an 8’ x 4’ table. 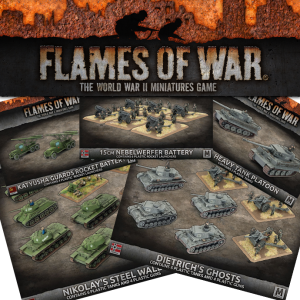 Anyone that has talked Flames of War with me for longer than 10 minutes has been regaled with various stories of horses thundering down on the enemy. Cossacks were my first army in 2004, and you never forget your first army. 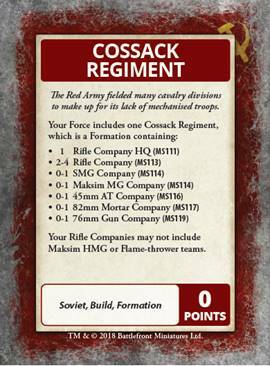 Cossack players are a small, fanatically loyal group to the army type. Anyone can play a tank, mechanized or straight-leg infantry army in any nation they choose. 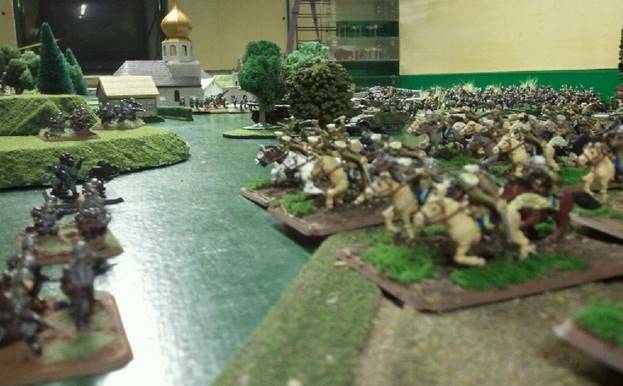 There’s only one Cossack Cavalry army. The Cossacks are basically mounted infantry, so start with either a standard or hero rifle formation, the you need to choose the proper card: either Cossack or Hero Cossack Regiment, which gives you the build information for your formation. I chose the Hero Cossacks although I was truly tempted to be able to make a massed cavalry charge with 29 bases using the standard unit. 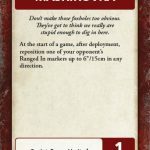 I want to make an army that will be fun and unique to play and compete against. HQ: I Have chosen to let the HQ unit remain dismounted : so 1 point there. 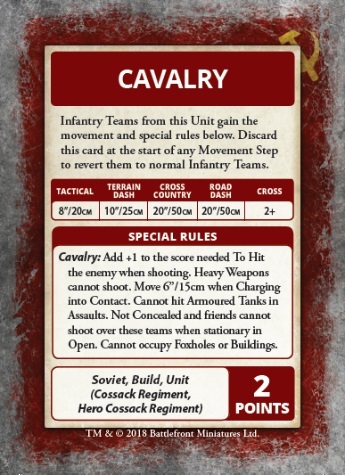 First Company : 10 + 1 stands with the Cavalry upgrade makes for 9 points. First assault group. Second Company : 10 + 1 stands plus a PTRD attachment, this will be my holding group. 8 points. 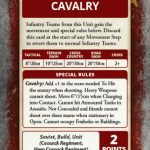 SMG Company : 7 + 1 Cavalry = 8 points. 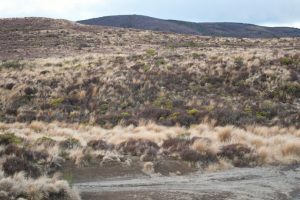 Second assault group. 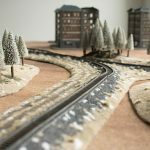 MG Company : 9 MG’s for 6 points? A great unit to stack with the holding company. 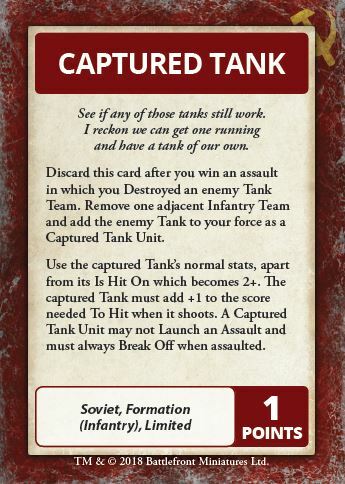 Perhaps if my player unit card comes out for Tachanka’s I can switch this over to a more mobile unit. 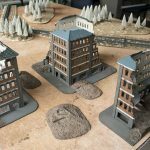 45mm AT Company : Cheap, decent AT. 4 long guns at 8 points. So 40 points for all my Formation units, time for the support! Artillery #1: The venerable and versatile ZIS-3 gun for the win! Let’s take four of them for 8 points. Artillery #2: Repeat success! Especially handy if there’s a lot of tanks and armored cars running around. 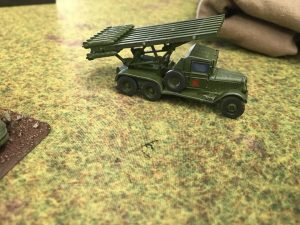 Artillery #23: let’s add some real punch now, Katyusha’s for the pain! 4 for 8 points. Anti-aircraft: How to protect all these from air attack, or just for additional infantry defense (also such an iconic soviet unit) DShK AA Trucks for 3 points. 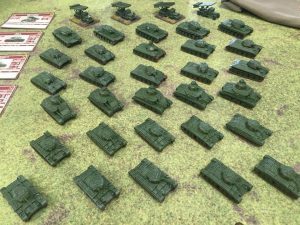 Anti-tank: More guns! I need something to kill the heavies, 57’s are the key. A whopping 18 points for four, but look at the stat-lines both for the guns and the crew. OK, that’s the troops, rolling in at 87 points. A little of everything and a minimum of motor-ized/armored units as I have historically played a heavily horse-mounted army. Not only is it a change to most players forces, but it’s ecologically friendly as well. Seriously though, I now have 13 points left over to play with, and these might explain why I chose this build. 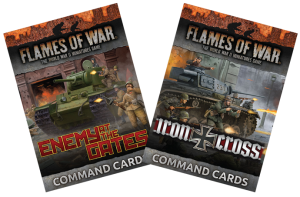 Time for the command cards. Beginning of the game, time to throw off the opponent. Reposition one of their Ranged In markers with Maskirova, and one of mine with Recon by Combat. I plan on doing a lot of assaulting, both mounted and dismounted. This might come in handy. Yes, I’m hoping for a bailed Tiger within range (Captured Tank). Lastly, because I think it would be fun. The armor finally catches up to my glorious horses…maybe (Fresh From The Factory). So that’s it, my first attempt at reviving my beloved horsemen in V4. I’m sure I will tweak this army as time goes on and games are played. In the meantime, I might not win but it will be a memorable fight. 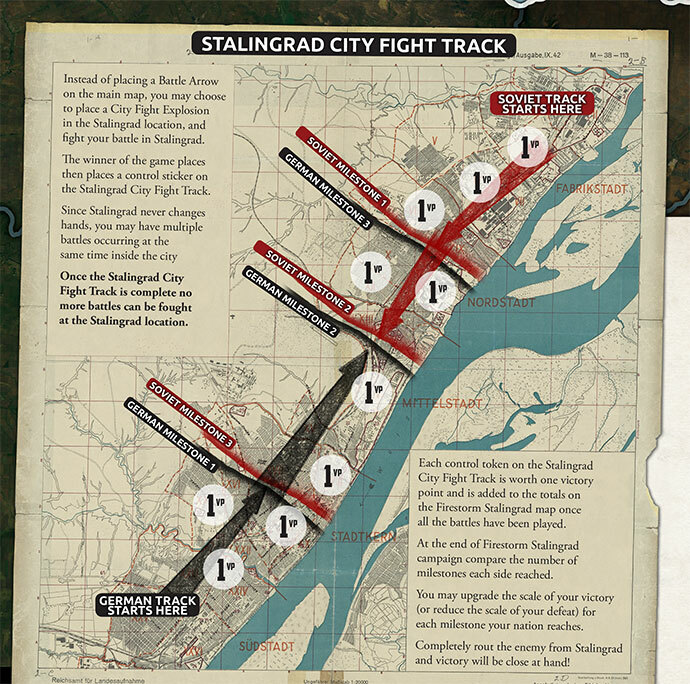 The first book that I worked on when I first started working at Battlefront was Stalingrad. 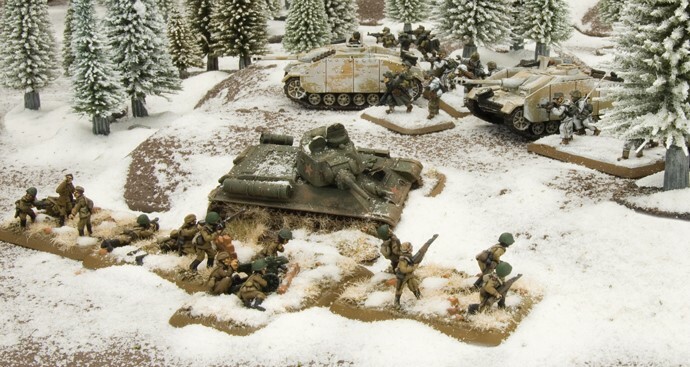 Consequently my first army was a Soviet infantry Battalion. 14 years, and a full infantry regiment later, we’re back where it all started. 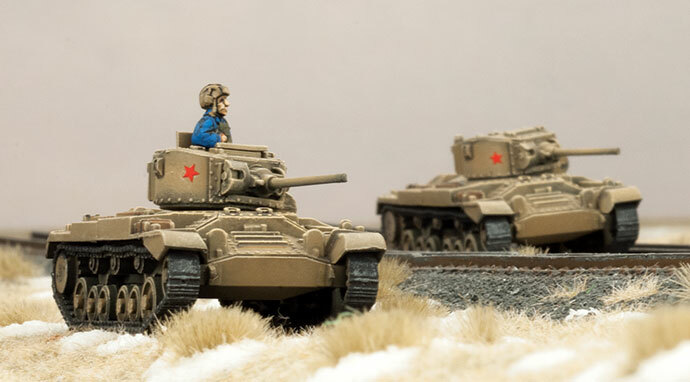 Like a lot of people I already have a large Soviet force (I have painted a lot of Soviets in my time at Battlefront), so the release of Enemy at the Gates is an opportunity to dust off some old models, add some of the cool new plastic kits, and play some games. Since most of my Mid-war Soviets are infantry I’ll have a look at those first. There are 2 options for Strelkovy, either the Rifle Battalion or the Hero Rifle Battalion. The army I used to run was very Infantry heavy, here is the equivalent force out of Enemy at the Gates. This is very similar to what I ran under previous versions, but I expect the army will act differently in V4. The infantry are harder to hit (3+ instead of 2+) but have a worse save (4+ instead of 3+) so I expect they will have a similar life expectancy as they used to. The Scouts and BA-10s have spearhead, so the infantry will start closer to the enemy meaning there will take a turn or two less shooting. With that in mind I’ll have to play a few games to try it out. 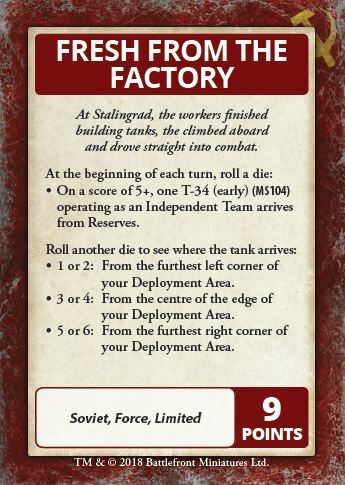 I may find that I don’t need the third infantry company any more, and that the force might be better served if those points were spent on some tanks to help shoot the infantry onto the objective (Valentines I’m looking at you). 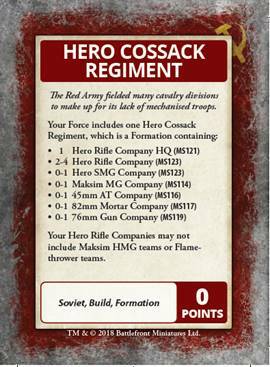 The other Infantry force in the book is the Hero Rifle Company. These are smaller, better trained units. However these units are the remnants of larger companies that have seen a lot of action so have a lower Morale. Any force I build using this list will be more of a combined arms force. The good thing about this force is that since the units are small, they are also cheap, so you can fit a lot of support in. The other benefit is that the combat platoons go back to having a 3+ save. I think this force will give me a bit more tactical flexibility. I am not convinced othat I need all 5 KV’s (4 would probably be enough), or the scout platoon when the BA-10s already give me spearhead. Those points would probably be better spent on a platoon of Valentines or some sneaky 57mm guns to give the army some anti-tank better than 9. 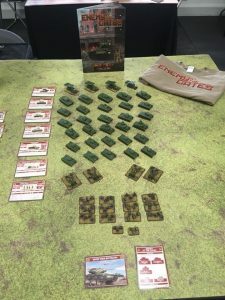 I have never been a massive fan of Artillery under previous versions of Flames Of War, it didn’t suit my aggressive play style as it took too long to be effective; my infantry had already bade it to the front line before there were enough casualties from artillery to make artillery worth it. Now however, I’m trying to find ways to add even more artillery. The Katyusha has got an even bigger boost as its firepower has gone up from 5+ to 4+. With the pre-ranged in bombardment and the salvo template I’m tempted to find a way to add in another battery. The good thing is that I can use my Shtraf Battalion to field most of this, however I’m still going to paint up some new KV-1 tanks and Katyushas (despite already having some) because the new models look so good. I guess now I’ll have to play some games to find out how it works. The other formation that has captured my interest is the Mixed Tankovy Battalion, but more on that later. 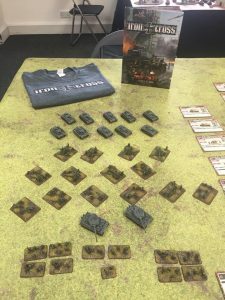 In part one I shared with you how I came around to choosing Soviets for the Enemy at the Gates army book release. My first unit had to be a unit of T-34s. 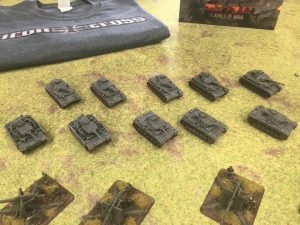 In the army book, there is a formation whereby you can, in theory, take two platoons of x10 T-34’s, and a HQ unit of x1 T-34 for a total of 21 T-34s. However, this would be 109 points, and so well outside the range for the brief we were given. 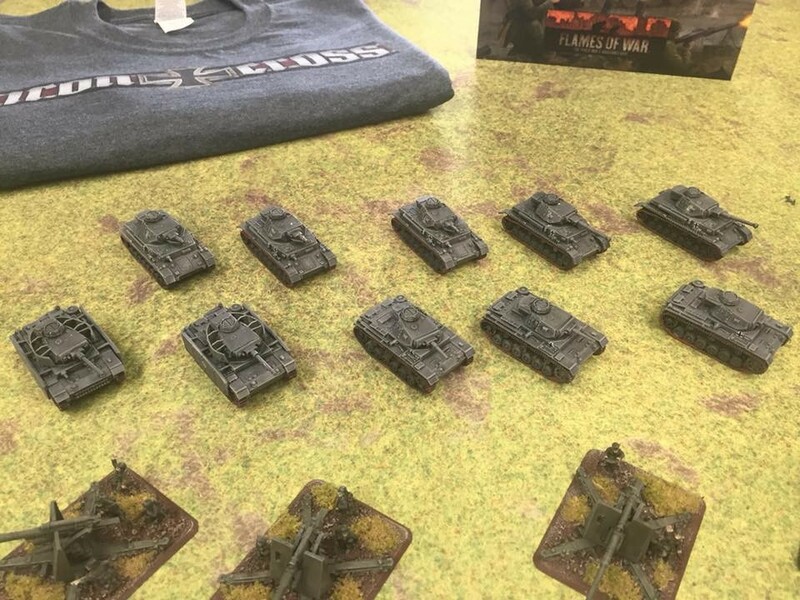 With the idea firmly rooted of taking a horde of T-34s, I scaled back the units, so that I was still formation legal, and I could keep some points free for some troops as support. My dubious calculations made for a total of 14 tanks. That’s 1 for the HQ, a platoon of 6 and a platoon of 7 T-34s. Looking at the stats for the T-34, I was further tempted by the 76mm main gun, which has a fairly decent range and an AT rating of 9. 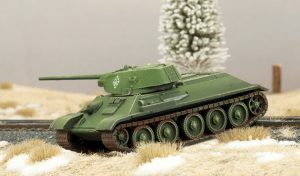 Added to this the T-34 has a cross rating of 3+ which reflects it’s wide tracks and decent size crossing rough terrain. Furthermore, it’s higher than average speed for the class, allows me to close with the enemy fast and start pinning them down with shots. Coupled with my ideas for support choices this could come in very handy. So up to now, I am at 73 points, and realistically, it is an easy army to paint being 14 tanks. But, my plan of churning out an army over the weekend somewhat failed with my next choices. 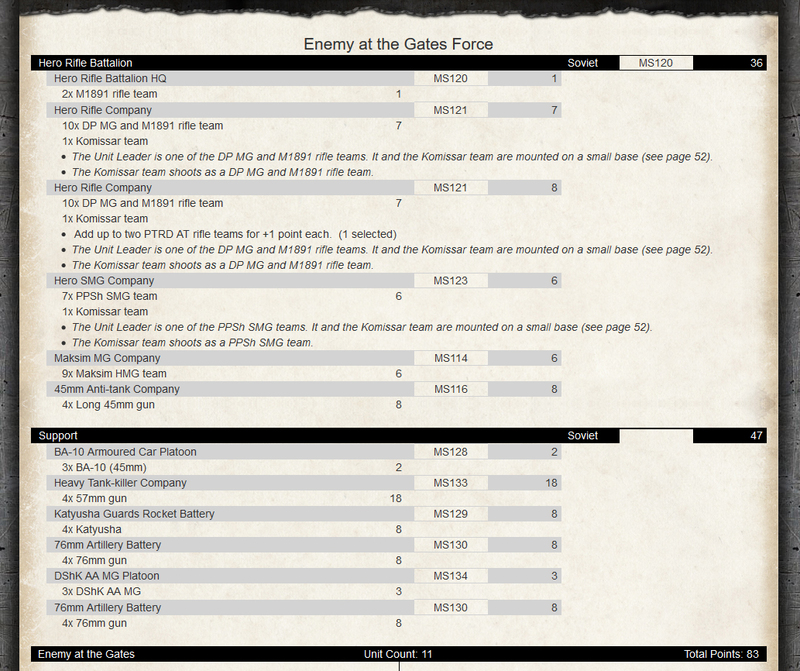 On the formation diagram, your support choices for the T-34 Battalion can come from Anti-Tank, Infantry or Artillery. I need infantry. To have a balanced army that can be vicious in the attack, but also hold objectives and make effective assaults, there is no other choice than a SMG company. 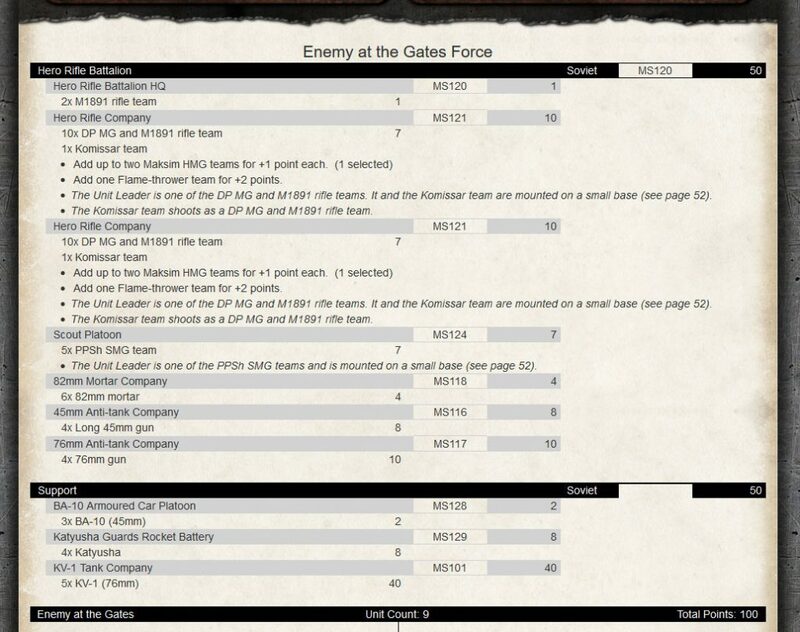 Not one to do things by half, I’ve decided to take a full SMG company of 22 stands of infantry with their appointed Komissar. This comes to 22points, and an army total of 95points. 22points seems a lot for a support choice, but in the assault, these dudes will be invaluable and allow me to clear any enemy infantry away from objectives and strongpoints. With a measly 5 points left to me, I looked through the command cards, however for the time being decided to buy an upgrade for my SMG team. 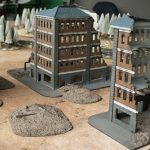 As I envisage a lot of our Eastern Front battles taking place on built up city boards with lots of buildings to clear and rubble to hold, I needed something that can further chew up enemy infantry. 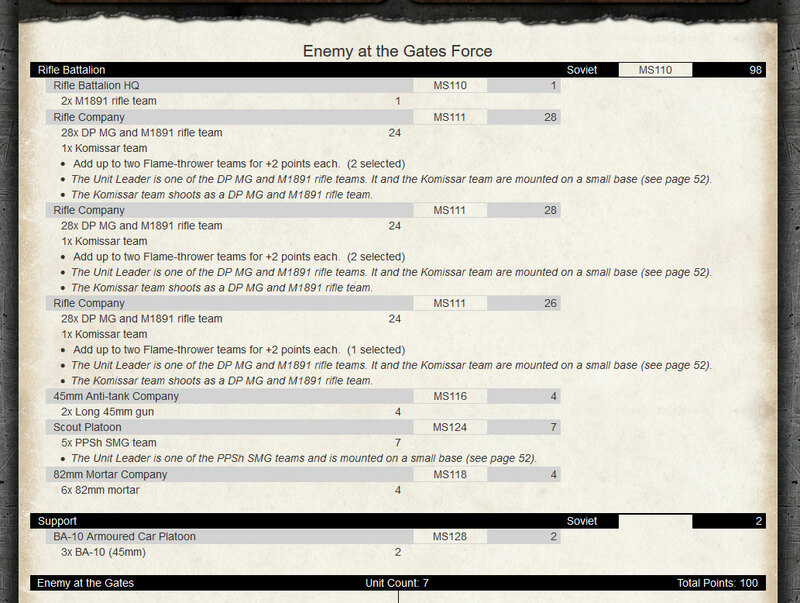 I can add up to two Flame-thrower teams for 2pts each to my SMG platoon. That’s a nice 99points that is well within my 100point goal. All I need to do now is gather and assemble my army and put down some basecoat paints on them to get them table-top ready. Once I’ve managed to get a couple of games in, I will re-evaluate my army composition. I can always reduce the amount of SMG teams in my platoon, thereby freeing up quite a few points to build a support mortar company or buy in some command cards. 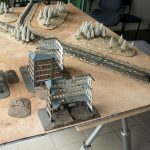 Last year we ran two tremendously fun Firestorm Campaigns for Team Yankee. 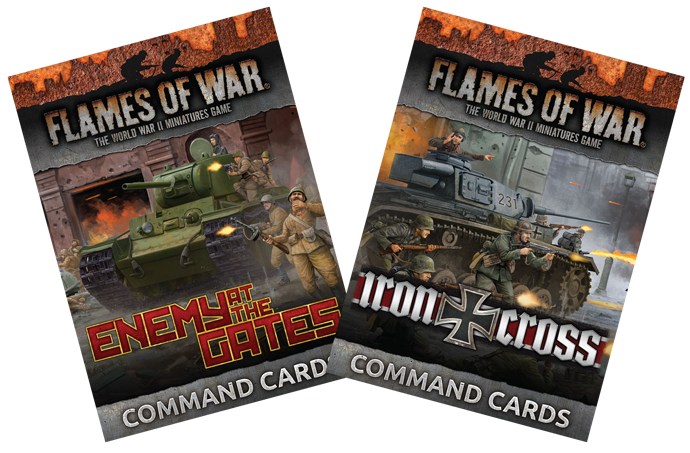 This year we have one planned for Flames Of War players. 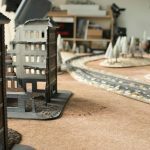 Welcome to Firestorm: Stalingrad! to encircle the city, forever cutting off the German Army. 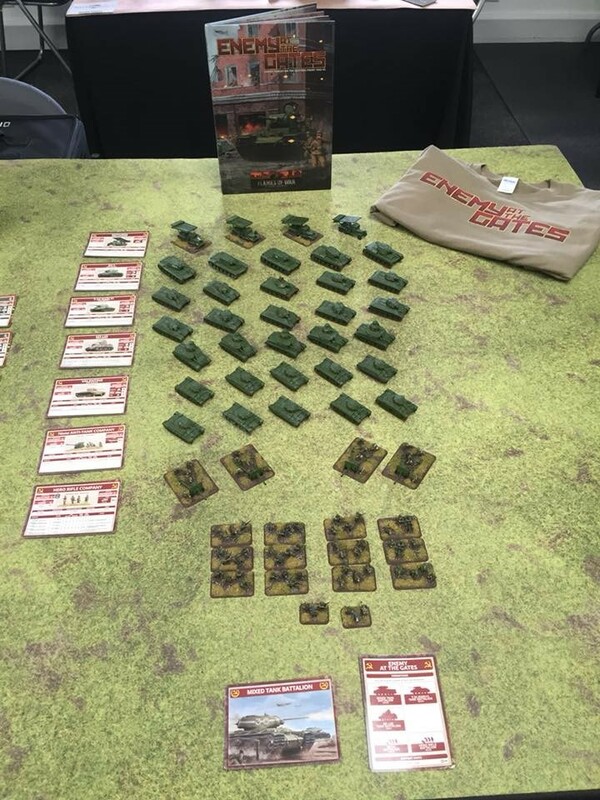 The Campaign pack will be available shortly and is designed (much like the previous Team Yankee versions) to be played over the course of a day as a single event, or over a series of nights or club days. 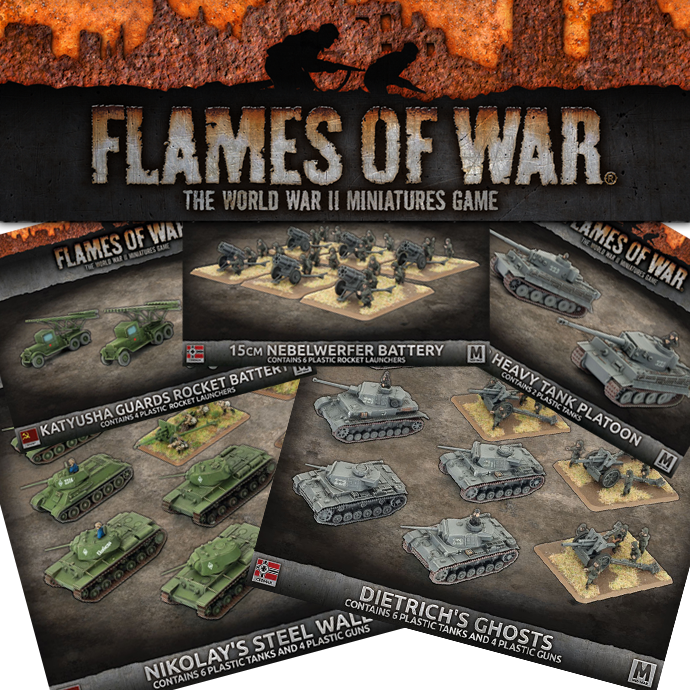 The campaign consists of a series of Flames Of War games in which players attempt to capture areas from the enemy or recover those lost in earlier games. Each time a player attacks they place a marker on the map, once all the markers have been used the campaign is over and the side with the most victory points wins. Unlike previous campaigns the winner is not solely determined by taking sectors, or areas. 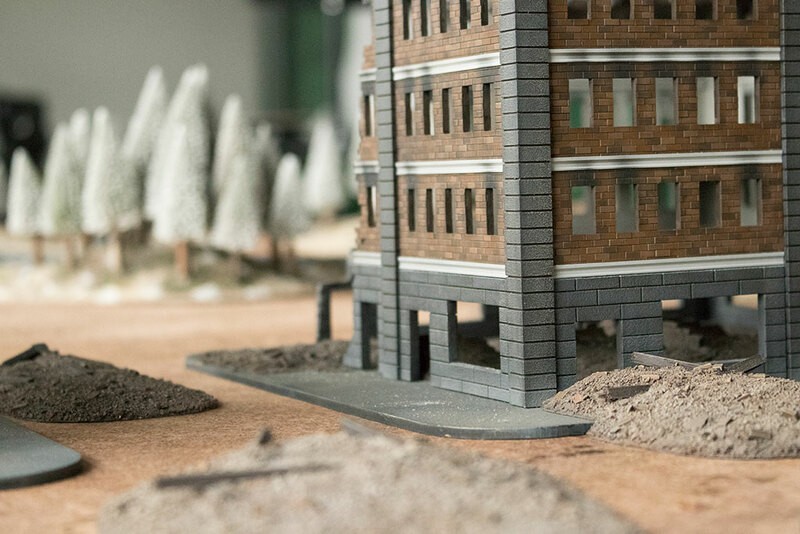 This time players will need to be mindful of what is happening inside Stalingrad itself! 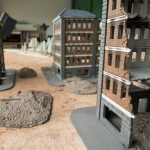 By capturing the city, a defeated side may be able to swing the final result, potentially turning a defeat into victory! 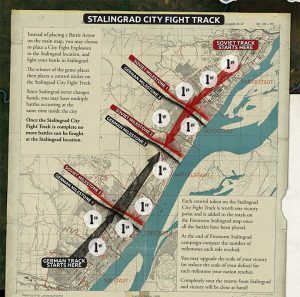 Returning to the Eastern Front is a pretty exciting time for the team at Battlefront and in my case, it is a chance to revisit the book that made me fall in love with this theatre, Stalingrad. Fast forward 13 years and we get to return to Stalingrad (and the rest of the Eastern Front) with Iron Cross and Enemy at the Gates. For me this means a chance to put a wall of humanity on the table and have them charge headlong into the guns of my opponent. Watching your troops get mercilessly gunned down might sound a little heart-breaking but the payback comes when your troops hit the thin red (or is that German Grey) line of enemies. Much like a tsunami there is no stopping the Soviet horde. Needless to say, the army I’ll be dusting off starts with a Rifle Battalion HQ and two Companies of infantry. I’ve picked the ‘small’ 20 team versions to leave me some points to add a Penal Company of another 20 teams to the core of the army. These cowards will form the ‘forlorn hope’ of my army and take this opportunity to redeem themselves at the forefront of my army. My opponents can choose to gun them down knowing that they won’t pick up a Victory Point for doing so, or can ignore them at their peril. With the wall of humanity taken care of it is time to add some support elements to my force. Since I don’t have any Flamethrower teams to pin down the enemy I’ve chosen to add two units of mortars and a unit of machine-guns. The reason for this is fairly simple, I feel like they are good bang for buck coming in at 11 points for the three units. 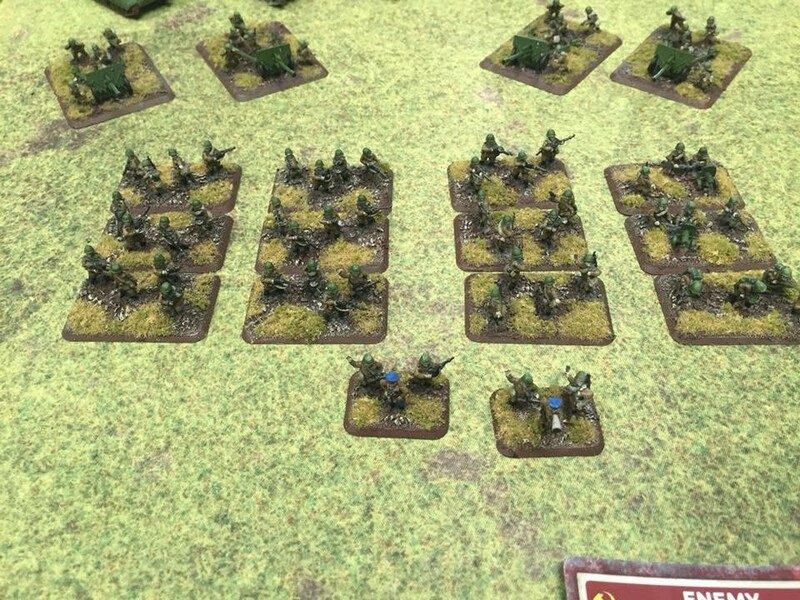 I can also position one unit of each flank where they can dig in once they get to a good firing point as they will probably need to self-observe their fire. So putting this aside I decided to stick with some more gun teams, adding in a battery of 76mm guns for artillery and improvised anti-tank work, along with a Heavy Tank-killer Company of 57mm guns. The 57mm guns are seriously nasty, having a range of 28”, Rate of Fire 2, and Anti-tank 11. These will have no problems slicing through enemy Panzers. Best of all they are rated as Careful and are hit on a 4+, with a 3+ save. 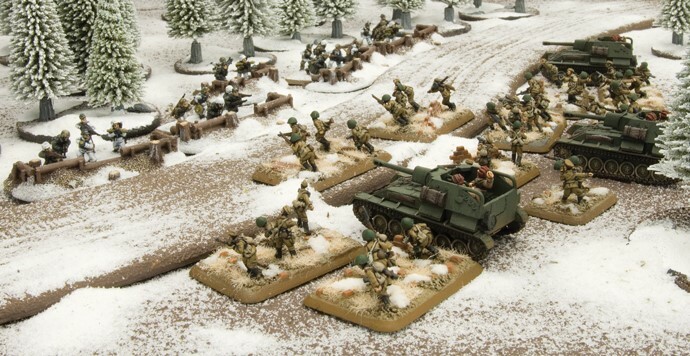 Assuming they are concealed and Gone to Ground this means they should survive the inevitable alpha strike as enemy Panzers make a rush at them. 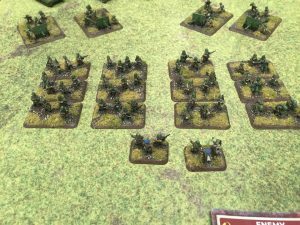 With a whole 7 points left I’ve added a Scout Platoon. They are purely there for their Scout and Spearhead rules. If you have every tried to fit 40+ infantry teams and support weapons on one flank in a game you will know how important it is to try and expand your deployment options. My plan is simple, attack, attack some more, then rally what is left and attack some more. Welcome, Battlefront UK. 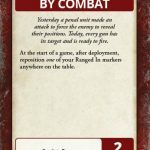 Your mission should you choose to accept it (and you will – no choice) is to provide two complete armies for our upcoming appearance on Beasts Of War. 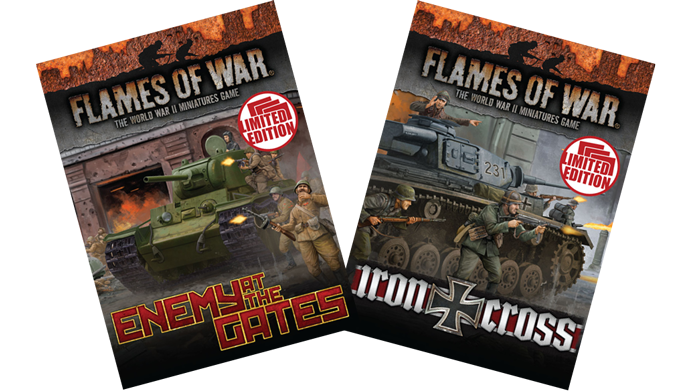 These will showcase the core of the new Iron Cross and Enemy At The Gates books, and allow your agent to showcase the new Soviet and German armies, as well as the brand new Stalingrad Two-player starter set. You have one week from today to accomplish your mission. This message will sit in your inbox until you comply. Okay; so maybe the order to assemble and paint two new armies didn’t come in as dramatic a fashion as described above, but it was certainly a task worthy of Ethan Hunt and the rest of the IMF team. 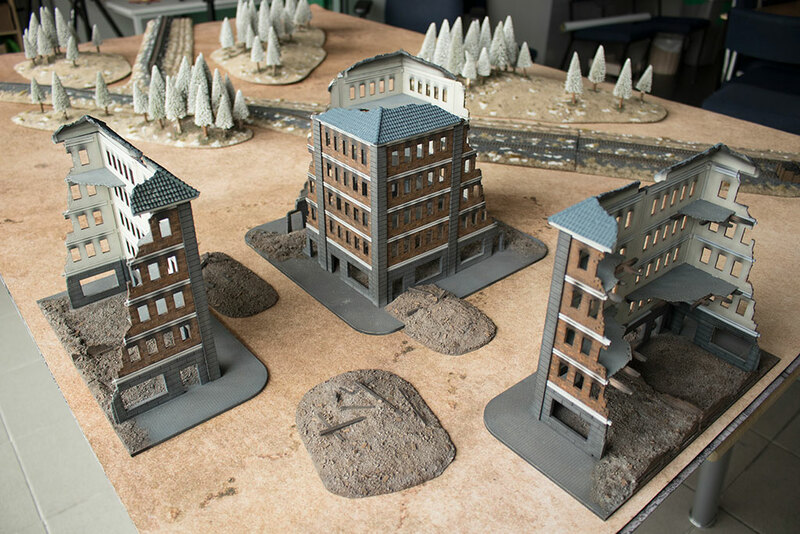 We were already each building and painting new armies for the Eastern Front launch, and now we had to put those aside and crack on with these. Worse still, we were two men down: Matt and Tim were both off living the dream in Croatia at the ETC (check out this photo album for all the action). 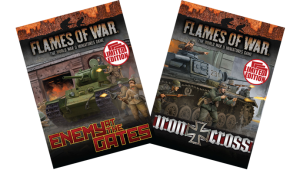 These are now over at the Beasts Of War studio where they will meet our roving reporter, Simon (aka ‘Freddy‘). 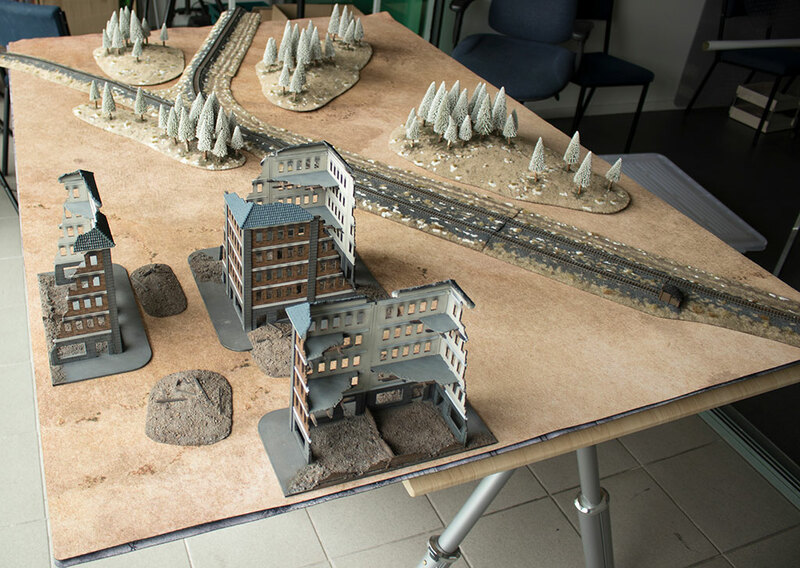 He’ll be exploring the new books, new armies and new starter set Stalingrad on their website this weekend. Since the launch of V3 and the subsequent army books, I have always been drawn to German armies. 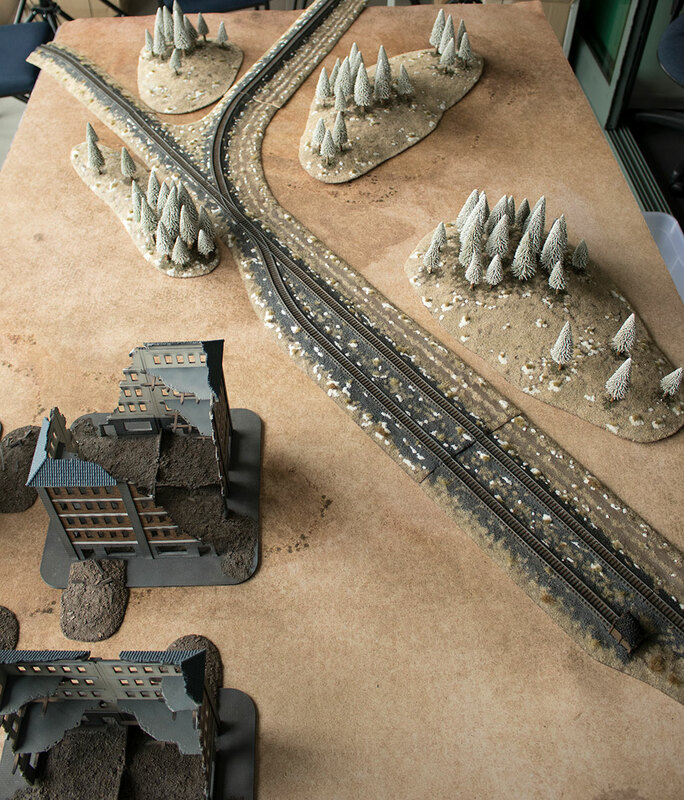 This theme continued in V4 with the war in the desert, where I have built a sizeable DAK force. 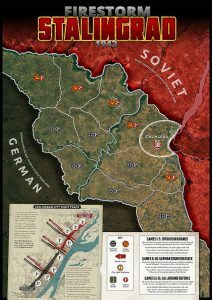 However, when the UK Sales office decided that we were all to design and build new armies for the Eastern Front books, the way for me was clear – мать Россия! Mother Russia! Going from the German Wehrmacht Army to a Soviet Red Army force, presented some interesting shifts for me; in terms of colour schemes, military doctrines and sheer numbers of models on the table. 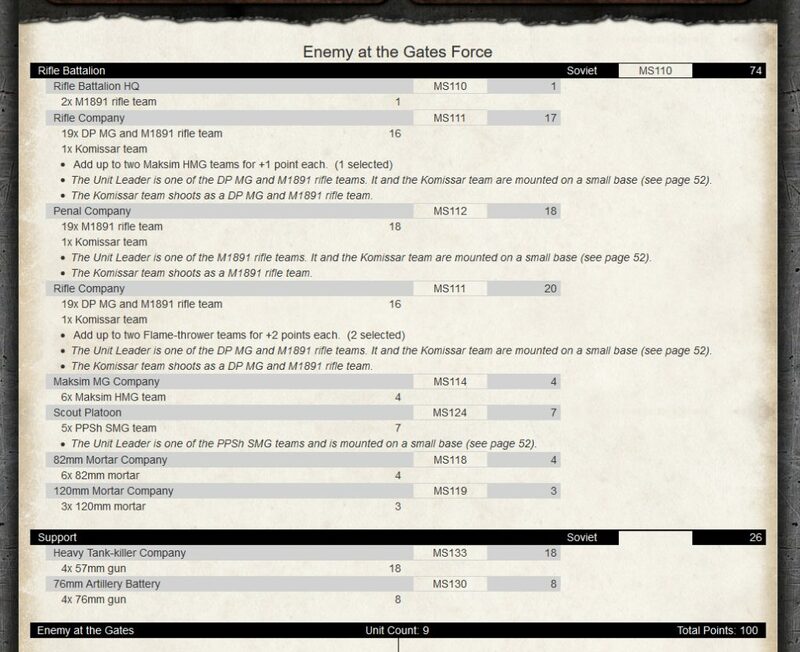 But mostly importantly (and the crucial swing vote) was the formation organisation charts in Enemy at the Gates army book. The force which grabbed me as soon as I was able to flick through the book, was the sheer numbers of T-34 tanks I could fit into an army list. I would be the first to admit that I’m a bit of a ‘tread-head’ when it comes to AFV (armoured fighting vehicles or Tanks!) and like nothing better than collecting, painting and looking at rows and rows of iron beasts. 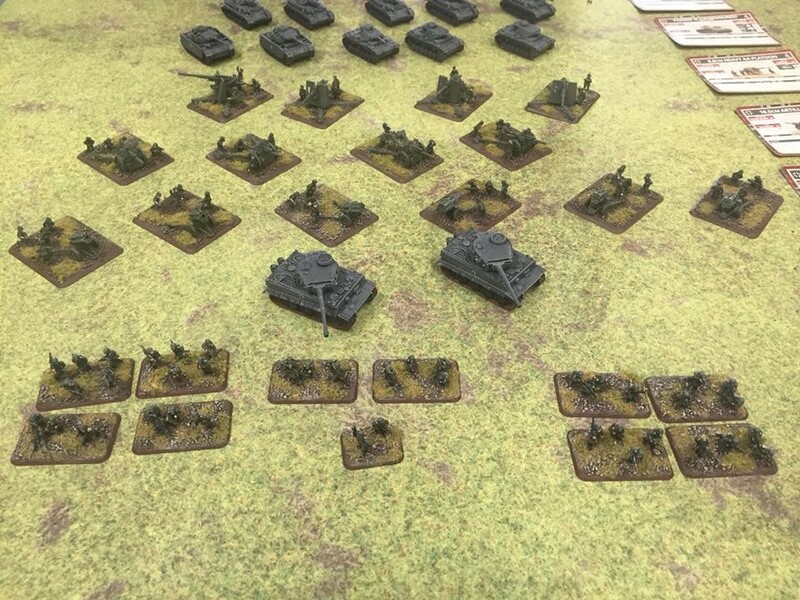 However, playing a German force, quite simply there is never enough tanks! And in the T-34 formation, I can take lots and lots of tanks to crush my enemies before me. As with any new list I’m planning on taking, I write out a list without points. This is my wish list. This allows me to go through and like a kid in a sweet shop, choose everything I want that I think looks cool and I think will work to my plans for the theatre. The Eastern Front is amazing as it has some seriously awesome potential fights ahead of me. 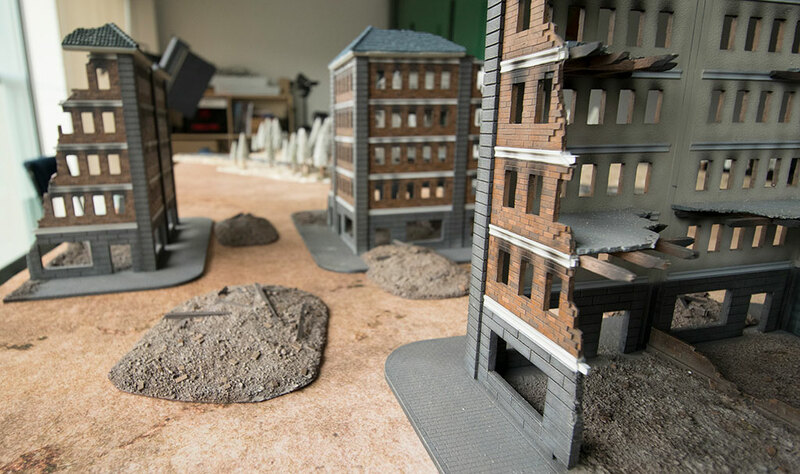 From sweeping tank battles around Kursk and Operation Citadel, to city fighting block by block in Stalingrad, and even with the new book, snipers duelling it out amongst shattered buildings. After I had added up my list and realised that there was never a hope that I could paint 22 tanks, with 44 stands of SMG-packing infantry, 4 Anti-Tank guns and a sniper team, I conservatively reduced my list down, mainly to fit within the 100pt force limit the office had set, and also my own painting time-constraints. That’s not to say that I didn’t manage to fit in 14 T-34 tanks, 22 stands of Red Army troops as well as some flamers in lieu of the snipers (I think Jonathan or Gareth wanted to be all heroic and sneaky, whereas I prefer all-out assault) Further I picked up a box of the Valentines for some Lend-Lease tanks for the times that the T-34 wouldn’t be able to match the likes of the specialist German support options. 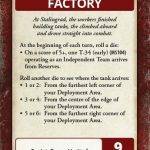 My excuse is we have the Germans on the run and can choose what units to deploy and when… The factories were all uprooted and moved East to ensure The Soviets didn’t lose the manufacturing capability after all. I planned to paint all the tanks in one batch, so as to ensure some degree of consistency between them as a finished article. Then I plan to tackle the infantry, which are my least favourite part of painting, however something which when done correctly, really stands out. Tune in for the next article, where I plan to outline my exact army, and the reasons for my choices, followed by my method of painting my Soviets, from idea conception to actually putting paint on the model.